The challenge of making concrete greener—reducing its sizable carbon footprint without compromising performance—is just like the world's most ubiquitous manufactured material—hard! But, according to a new report from the National Institute of Standards and Technology (NIST), the potential engineering performance, energy-efficiency and environmental benefits make it a challenge worth tackling. Many factors determine the overall energy and environmental impact of concrete. However, reducing the amount of portland cement, which reacts with water to bind all the sand, stone and the other constituents of concrete as it hardens, provides the biggest opportunity. Depending on the particular concrete formulation that is used, portland cement accounts for approximately one-quarter of the total mass, and it is the product of a very energy-intensive process. Nearly a kilogram of carbon dioxide, the main greenhouse gas, is produced for each kilogram of concrete that is constructed. Portland cement manufacturing accounts for more than 5 percent of U.S. industrial carbon-dioxide emissions, according to the report. In addition, the U.S. cement industry consumes 400 gigajoules of energy annually. That's equivalent to the energy required to power more than 3 million homes each year. 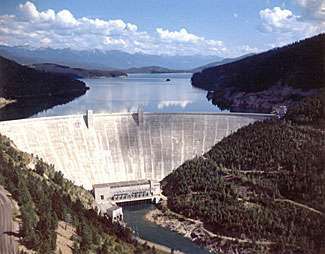 The output of a workshop of experts drawn from industry, academia, and state and federal government, the report identifies barriers to acceptance and use of concrete in which greater fractions (30 percent or more) of the portland cement have been replaced by fly ash from electrical power plants and other industrial byproduct materials. The measurement science barriers are identified, along with high-priority topics for research. Before broad acceptance of green concrete can occur, the report says, "overly-restrictive prescriptive-specifications need to be overcome, and the performance of green concretes must be demonstrated to be either equivalent (to concrete using portland cement) or sufficient for the intended application, which may require performance beyond that of portland cement concrete." Developing tools and metrics for quantifying the advantages and disadvantages of using different materials in concrete. Developing and validating computer models that can predict the performance of green concrete mixtures, both during construction and over the long term. Improving test methods for characterizing materials such as fly ash, glasses, and minerals and other portland cement substitutes to determine whether they will perform as required. Developing a more complete understanding of the water-driven chemical interactions that occur as industrial byproduct materials and other components are incorporated into concrete. The report also highlights the importance of stakeholder education to increase industry awareness and understanding of the performance and capabilities of alternative concrete mixtures. Meeting the challenges identified at the experts workshop will require new "measurement science" the report says, "for quantifying and ensuring the short-and long-term performance of green concrete."